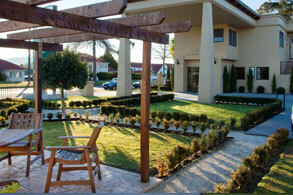 Tuscany Villas offers centrally located luxury accommodation in Rotorua town centre. In addition, our fantastic Rotorua conference centre is only a two minute drive or easy 15 minute walk to the central shopping area. With a number of restaurants and supermarkets, Fenton Street is a great spot for your Rotorua motel accommodation and is a direct route into town. Tuscany Villas is also in close driving distance to many local Rotorua attractions. Whakarewarewa Thermal Village and Te Puia are just a three-minute drive, while Skyline Skyrides and the Agrodome are both just a 10-minute drive away. Lake Rotorua and two great golf courses are also located around five minutes drive from our Luxury Rotorua motel. If you're visiting Rotorua for a conference or event, our Rotorua motel is within five minutes' drive of the Events Centre, the Convention Centre and the International Stadium. Or host your next Rotorua conference at Tuscany Villas, contact us for more information. Enjoy the indoor and outdoor stalls at this fun lake front market. A wide range of goodies available. On every 2nd Sunday . 9am to 3pm. Rotorua now has a Night Market every Thursday evening. UPDATE: Market has proved so popular it is now on permanently . Well done Rotorua.